MSF is where families, scouts and individuals come to learn about horses and their interaction with each other plus other 4-legged and 2-legged critters. While learning how to ride, take care of the horses, both big and mini, interact with the goats, learn barn and field maintenance, the individuals learn about themselves as well. Kudos to the award-winning teaching team of Judy and Shelly!! My son loves going to Morning Star for his weekly lesson. He has an amazing time learning the different riding techniques while forming a bond with the trainers. The personal touches given by each staff member is what brings us back each week. You're more than just a client, you feel like part of the farm family. Judy and Shelly have a love for what they do and it can be seen in how they run the business. Each horse that we have encountered has such a calm demeaner. You can tell that comes from the staff that interact with them each day. Thank you Shelly, Judy, and everyone at Morning Star! I can't say enough great things about my daughter's experience at Horse Camp this summer -- this great review is long overdue! My girl had a great time, learned so much and really loved every day. I love that it is so friendly and easy going while making safety and learning such a high priority. I'm SO glad we just got to drop by and see the new mini horses, Chewy the donkey and, of course, the regal Patriot. Happy Holiday Morning Star! Morning Star Farm is an amazing riding academy that is family oriented and great for children! We love it! ?? Thank you Shelly and Judy for an amazing 5 months. The growth we have seen in Tommy is more than we could ask for. With your love, support and friendship we have seen tommys anxiety go down, more communication and a love for horses that is so pure. We look forward to many more years with you and making more memories, progress and lasting friendships. One of my favorite places on this earth, with some of my most favorite people that I love. People come here to heal, be loved, and remember what it is to be human. In 1993 we decided to begin offering he Horsemanship Merit Badge at our boy scout camp in Blairstown. I am SO glad to have found this gem of a horse farm run by the incredibly talented, joy filled, and supportive Judy Heim! The Horsemanship program at Morning Star Farm quickly became recognized as the premier program in the Northeast Region! After having to use another farm for a few years, I am very happy that we were able to return to Morning Star and become reunited with Judy and Shelley. They welcome our scouts to the farm every week during the summer and do an incredible job in helping each scout fulfill the requirements of the Horsemanship Merit Badge! Our scouts give them two thumbs up each week. Thank you Judy and Shelley for all you do for our boy scouts and all others who are fortunate to ride and learn with you! We can't say enough good things about MSF. Our family is greeted every time with smiles and hugs from Judy and Shelly. Everyone is careful with the safety and welfare of the children. The staff is well trained! The atmosphere is relaxed. The words "try" and "do your best" are used along with praise and rewards. Having fun and making new friends is very important. If you love and want to learn to ride horses, this is the place for you. The smiles on the kids faces tell everyone they are comfortable and having a great time. Morning Star Farm reunited me with my passion of riding. It became my safe haven, refuge, and source of happiness from the stress of school and personal issues I was having- and it still is! It brought me happiness even in the darkest of days and it continues to do so. Judy, Shelly, Kaitlyn, and the rest of the staff are incredible people who have such a kind heart and make the farm a loving and welcoming environment in which to work and ride. They are the kind of people that have performed miracles-who have turned the "greenest" horse into the "favorite" horse, and have helped the child who would never had the courage to get on a horse, into a rider who can ride independently. I've never met anyone so genuinely kind, real, and passionate for what they do. And the horses are just as amazing, gentle, and pure reflections of their love and kindness. It makes me thank God every day for seeing that Morning Star Farm job listing in the grocery store 6 years ago. So if you are looking to become a better rider, perhaps a future horse owner like myself, and at the same time want a family deeply rooted in something you are so passionate about, Morning Star Farm is the place to be. This is no ordinary barn- I can honestly say Morning Star Farm saved my life.t care so deeply for not only for their horses, but for their riders and staff. They are the kind of people that have performed miracles- who have turned the "greenest" horse into the "favorite" horse, and have helped turn the child who never would've had the courage to get on a horse, into a rider who can ride independently. I've never met anyone so genuinely kind, real, and passionate for what they do. And the horses are just as amazing, gentle, and pure reflections of their love and kindness. It makes me thank God everyday for seeing that Morning Star Farm job listing in the grocery store 6 years ago. So if you are looking to become a better rider, or perhaps a future horse owner like myself, and at the same time want a family deeply rooted in something you are so passionate about, Morning Star Farm is the place to be. This is no ordinary barn- I can honestly say Morning Star Farm saved my life. My son loves riding at Morning Star Farms in Fredon! Judy and Shelly are amazing woman and bring a smile to my son's face. Beautiful Farm and wonderful volunteers!!! Highly recommend them...love you guys! they care so deeply for not only for their horses, but for their riders and staff. They are the kind of people that have performed miracles- who have turned the "greenest" horse into the "favorite" horse, and have helped turn the child who never would've had the courage to get on a horse, into a rider who can ride independently. I've never met anyone so genuinely kind, real, and passionate for what they do. And the horses are just as amazing, gentle, and pure reflections of their love and kindness. It makes me thank God everyday for seeing that Morning Star Farm job listing in the grocery store 6 years ago. My boys have been going for almost two years and absolutely love spending time here! The people are amazing and love every child!So if you are looking to become a better rider, or perhaps a future horse owner like myself, and at the same time want a family deeply rooted in something you are so passionate about, Morning Star Farm is the place to be. This was my niece's third summer of horse camp at Morning Star Farm. She learned more than the essentials of riding. She was directly involved in the care and feeding of the horses. Most importantly, however, she had FUN! Shelly stressed this over and over again. I'm sure it is one of the key elements that keep us coming back every summer. Shelly and Judy have created a unique, caring, and fun horsemanship camp!!!!! Looking forward to next summer. have performed miracles- who have turned the "greenest" horse into the "favorite" horse, and have helped turn the child who never would've had the courage to get on a horse, into a rider who can ride independently. I've never met anyone so genuinely kind, real, and passionate for what they do. And the horses are just as amazing, gentle, and pure reflections of their love and kindness. It makes me thank God everyday for seeing that Morning Star Farm job listing in the grocery store 6 years ago. Absolutely the most amazing place with the most amazing people. My daughter has been riding at Morning Star since she was 7, she's now almost 19 . This summer she had the most wonderful opportunity to work there. Highly recommended. Beautiful setting, and a great place to watch your children grow.I can't Thank you enough Judy and Shelly for all you've done. The people at morning star were so kind to me and my 9 year old niece. i have never reviewed anything before but i feel compelled to get the word out that these people are wonderful. the farm was beautiful and they went out of their way to accommodate my niece. she is grieving the loss of her mother and the staff was so empathetic. it brought tears to my eyes. thank you so much judy. Morning star farms, has helped my daughter in a way no one will ever understand, they offer therapy riding as well as regular riding, and my daughter had lost a sibling, she was very depressed and I was running out of resources to try and help her, I found morning star farm, and reached out to the owner Judy. She took the time to listen and understand what I was dealing with, she invited Haley to try the therapy riding. Within weeks i saw a dramatic change in my child's overall attitude and behavior, she was turning around!! This farm did more then teach my daughter how to ride and care for horses, they taught her how to overcome a dramatic grief and how to continue on with life and how to have an amazing outlook on the world!! Morning star farms is the amazing and i would recommend them 1,000 times everyday to anyone looking to teach there child not only how to ride, but how to develop everlasting friendships!! My daughter has been going here for years. The owners are tremendously caring. They ensure not only that the children know how to ride, but also how to take care of the horses, which creates a beautiful bond between them and the horses. Can't say enough about how much my children have enjoyed riding here. The people at morning star were so kind to me and my 9 year old niece. i have never reviewed anything before but i feel compelled to get the word out that these people are wonderful. the farm was beautiful and they went out of their way to accomadate my niece. she is grieving the loss of her mother and the staff was so empathetic. it brought tears to my eyes. thank you so much judy. I have four girls that ride at Morning Star farm and we love Ms. Shelly and Ms. Judy. My girls take riding lessons and attend their camp. There farm is friendly, horses well cared for, instructions are individualized for our girls, and it is obvious that they care about both the kids and the animals. Our girls are becoming stronger more independent girls due to the lessons at the farm and we are grateful. Morning Star Farm has become a very happy part of our weeks! Sofia looks forward to her lessons and it is awesome that every second lesson of the week they allow my husband or me to ride with her!! It has become a great opportunity for daddy-daughter bonding!! Shelley, Judy, and the rest of the gang truly make us feel like part of the family. We just love this farm. The owner, Judy, and her daughter, Shelly, are just wonderful! They are patient, gentle, caring and always willing to take time and answer my children's MANY questions. I ride, along with my 3-year old and 8-year old, and we all look forward to the days when we can ride. It is the highlight of our week! They also offer a wonderful horsemanship program that allows children to get some hands on experience with the care and grooming of the horses. Our family is so grateful that we have found this this farm and these wonderful women. They truly feel like family to us. I'd just like to thank Judy and Shelly for making my daughters horse riding experience a great one. We were at the farm for 4 years, and in that time she learned so much about horses and herself! I don't believe she ever wouldn't gotten on a horse if it wasn't for Shelly and all her patience. She put her heart and soul into my daughter(s) and we will always love her. Ready with a big hug, kind words and lots of encouragement is how every lesson started, no matter what was going on with her that day. Thanks ladies. You really know how to touch peoples lives!! I love this place! Very much!!! long time. There is no better place for a child to ride. NEWTON July 13, 2014 -- Morning Star Farms has been selected for the 2014 Best of Newton Award in the Horseback Riding category by the Newton Award Program. Each year, the Newton Award Program identifies companies that we believe have achieved exceptional marketing success in their local community and business category. These are local companies that enhance the positive image of small business through service to their customers and our community. These exceptional companies help make the Newton area a great place to live, work and play. Various sources of information were gathered and analyzed to choose the winners in each category. The 2014 Newton Award Program focuses on quality, not quantity. Winners are determined based on the information gathered both internally by the Newton Award Program and data provided by third parties. The Newton Award Program is an annual awards program honoring the achievements and accomplishments of local businesses throughout the Newton area. Recognition is given to those companies that have shown the ability to use their best practices and implemented programs to generate competitive advantages and long-term value. The Newton Award Program was established to recognize the best of local businesses in our community. Our organization works exclusively with local business owners, trade groups, professional associations and other business advertising and marketing groups. Our mission is to recognize the small business community's contributions to the U.S. economy. I started bringing my daughter to morning star farms back in June 2011. My daughter was 3 yrs old and wanted to ride a horse. Based on a reccomendation from a friend we tried out the farm. From that first day we were treated like family. Everyone was helpful, positive and loving. Shelly, our instructor went out of her way for my daughter. Later I realized that she does this for everyone. She loves what she does and she really loves working with the younger kids. My daughter has found a real love in riding and this has been such a great experience for all of us. My younger daughter cannot wait to start riding and I admit that now I want to start riding come the spring. It will be such a great family activity and I can thank everyone from morning star farms for making it happen. If you are looking for riding instructions for a young child or disabled adult, this is the place to go to. Judy and Shelley are very professional and treat everyone like family. The horses are well-kept and the landscape is serene. On a warm day while watching your child riding, it is easy to drift into another world of peace and tranquility. This is the third year we have enrolled our disabled son in riding lessons to improve his balance and stamina. He has improved each year to his delight. I give Morningstar five stars as they earned the highest rating with their excellent handling of all functions of a horse riding farm. My daughter and I ride and board a horse at Morningstar farm. Judy and Shelly take very good care of all the horses. When I see other farms with their horses out in the fields in bitter cold, rain, snow, ice I know that my horse is in her clean stall with pently of feed, hay, warmth and water. Judy and Shelly are very down to earth people and treat you like family. They put their heart into taking care of the horses and teaching childern and adults how to care of a horse and how to ride.They have an excellent riding program, Morningstar Farm Sunday horsemanship riding progarm. The fee is very reasonable for amount of time and what they learn at the farm.This is the third riding school I have been to and it is the best. I have never owned a horse before after being at the farm for three years my daughter and I felt that what we learned from Judy and Shelly about horses we were ready to own one and they are always there to help us.They gave my daughter and I the confidence we needed to succeed as riders and owners. We have been so pleased with our riding experience at Morning Star Farm. When my daughter participated in an out of state horse camp at age 5 and loved it, I knew we had to find a barn in Sussex to continue riding and horsemanship. Judy and Shelly were willing to try her in a few lessons and from there decided she would do well in horsemanship. Erin was so excited to work with the older girls. Now she has been riding for 2.5 years, and Judy, Shelly and the staff at the farm have become family. My 5 year old has also started riding and Shelly has a knack for bringing him out of his shell. The farm is safe and horses mild mannered and well kept and the overall cost is the lowest in the county. I would highly recommend Morning Star Farm to anyone interested in riding. This farm is wonderful! I recently graduated from Centenary College with a concentration in riding instruction and training. . I have excellent knowledge of horses, horse care and instruction. I am now working at Morning Star Farm for two years. Not only do I work here at Morning Star Farm, but I also grew up here. I bought my first horse from Judy when I was 8 years old and learned to love and respect people and animals alike. Morning Star Farm not only gives great instruction but has some of the best teachers one could ask for and excellent horses that walk these grounds. I am honored to teach lessons on some of the kindest, safest, and well behaved horses there are. All of these horses are well cared for and are treated with the most respect because to us they are part of a family not just a pet. Judy, Shelly and myself take a lot of pride in what we do and get much enjoyment in sharing the horse world with our students. The smile on their faces and watching them advance means everything to us. I believe Morning Star Farm popped up in my life for a reason. Surviving high-school isn’t easy, and they have served as a salvation for me where I could be around horses, the only thing that keeps me sane. Unlike most people, I love my job because it makes you more responsible and a better person. My job consists of assisting lessons, tacking and untacking horses, feeding, haying, watering, grooming, and taking horses in. 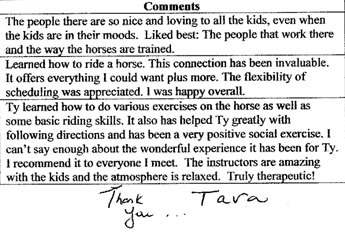 I have been volunteering with their amazing Therapy Riding Program; I am witness to the progress being made in each child. This is evident on every mother and father’s face. The horses are so experienced and well-mannered. Not only this, I have the privilege to ride here as well. The riding program is excellent, in which you learn to perfect the craft of horse-back riding and gain horse experience as well. It is preparing me for riding in college. But with this, I could not be around people who love their job as much as the people at MSF do. To me, it is such a nice atmosphere where there is no presumptuousness or judgment of experience level. I have been riding at other stables, and this environment is one-of-a-kind that no other stable has. It doesn’t matter who you are or how much your family makes. It is about the determination to want to ride, to be a better rider, and for the ones who just have a love for horses. Throughout my whole riding experience, Morning Star Farm is my first choice. I passed the farm on a cold morning as I took a sick kiddo to the Dr. The horses were all blanketed, clustered around huge rounds of hay and it made me think of how many life changing hours we've spent at Morning Star. Thank you for allowing us the privilege of working on the farm and taking lessons. This farm does so much more than teach riding lessons, they teach life lessons. By letting the children help feed, water and clean the stalls every day, you've taught them not only how to care for the horses, but perseverance in hard work, pride in a job well done, patience in waiting their turns (and with the horses), responsibility and charity in caring for the rescue horses that need extra love and attention. You've taught them the right ethics of a good life by your example of hard work and care, no matter the conditions. Every day these virtues are seen, too, with the love that the owners share for the horses and the farm. I never quite understood why being a part of a horse farm was considered therapeutic, but now I do. Horse riding lessons are not only about riding horses--and if they were that would be enough, but they encompass so much more, and Judy and her team are the best teachers a student could ask for. Without hesitation I recommend Morning Star Farm to all, and know that they will have the same experience we have had. Simply the Best !!!! If you are looking for a caring, nurturing fully rounded experience for your child, Morningstar is the place. Those who have been fortunate enough to have found Judy and Shelly will undoubtedly feel blessed know them. After raising two girls around horses and farms, we know there are times as part of growing they tend to get ahead of themselves.. Judy has displayed on many occasions a compromise, always for the greater good of the children which is an artform. I would describe the experience at Morningstar Farm as much more than horsemanship, it will evolve into a child that will understand horsemanship, responsiblilty, dedication that all are terrific life character traits, even more important as they grow and are surrounded by other influences. 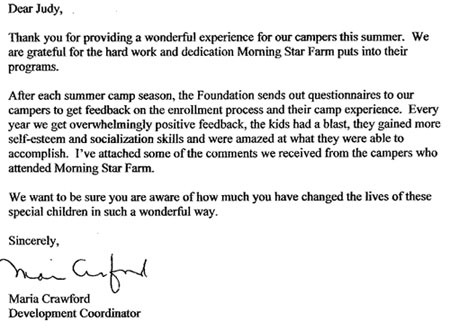 I am proud of the people that my daughters have become and I believe wholeheartedly that Morningstar played an important part in help building their character.Thank You Judy & Shelly!!! WONDERFUL!! There is nothing more important or precious to us than our four children and when we started them riding at Morning Star we realized that we had found a place and people who felt the same way about them. They are receiving exemplary training in all areas of horsemanship and were quickly comfortable riding and caring for horses. They LOVE going for their lessons and even ride throughout the winter months because they simply can't imagine not being at the farm! Shelly and Judy are not only wonderful instructors and people they are an invaluable member of the Fredon community and have created the most open and caring environment on their farm! It is truly a unique and wonderful place and anyone would be lucky to ride and spend time there.....even our Pop-Pop has fallen in love with the farm and at age 71 has begun taking his own lessons! "When my 4 year old daughter told me she wanted to ride a horse, we were blessed to find Morning Star Farm." It was my first phone call and only call I made. She has been riding there more than 1 year now and we can't imagine being anywhere else." "The Farm is a beautiful, serene place that welcomes you from the moment you arrive. It is not only the lovliness of the farm that draws you in; it is the compassion of the people as well." "From the moment my daughter started her lessons, it was as if her instructor, Shelly had know her forever. Shelly is patient and kind and understood what my daughter needed to succeed. The skills she has learned over the pasto year and a half are overwhelming. I thank Shelly for giving her the confience she needed to come out of her shell" "You can bring your children to Morning Star Farm to learn to ride and the experience they have ill give them so much more". Dear Miss Shelly, Thank you Morning Star Farm for your great introduction to the world of horses. We all have had such a great time. Erin really loves riding and learning horsemanship. Thank you so much for all your support. I started riding here four years ago with a friend, and we love it as much now as we did then. I have learned not only to ride to cross rails but also horse care, preventative care and respect for all the animals and the riders. Shelly and Judy are really amazing, they spend so much time with me, I can just hang out when I want to at the farm, its like a big family, pick my horse to ride each week, swim during the summer and basically just have the best time ever. I can't wait to be there especially to ride Apache! I love Apache!! I would love to work there when I am old enough and help teach the classes and care for the horses. I just love Morning Star and tell everybody they should spend time there. Its a wonderful place to be!! Morning star Farm is a beautiful hunter farm. I can honesstly say that Morning star farm has been a second home for me. It is a great place to begin your riding experience in a positive way. I had my horse there for 8 years before moving out of state, even after moving, judy and shelly were always so helpful with my horse, she stayed there many months after the move before gettining settled in, Throughout the years they became like family Its deffinitly worth a try, They created one of the most caring, loving environments ive ever surrounded myself i, The horses are well fed , well taken care of, and others are always put first, Judy and Shelly are such caring people who love and attain to each horses necessites, This farm is very special to me and I have a really hard time staying away from the stable evne being hours away. They tought em everything i needed to know to get to the level i am at now, Ive had so many amazing experiences and unforgettable memories. have been family for many years.. Riding a horse is like learning a piece of music. You practice, and listen see where you are wrong. Practice some more. Riding is the same way learning a bounce or 3' 6" or some sorta of triple/double, or the forte part in your song, is like learning to make a bound with your horse. And once you learn your piece, inside and out, can play with your eyes closed, listening to just yourself play your piece, no mistakes, you have also found your bound. Each stride, a beat, each time you go over a jump, an accent. Here you can finish your piece. At this barn you will learn to play your music. It is a riding barn isn't it? It isn't about whether you are with your friends, or whether the barns are spotless, or whether the horses are all worth 100000 dollars. It's about learning your song. I am learning my piece at MSF and I'm almost finished learning it But I will finish it here. And then I will play, with my eyes closed, no mistakes, just myself and my horse . "wonderful farm, beautiful, well kept, and fun. I promise to you that if you send your kids to this barn it will be their best memories! 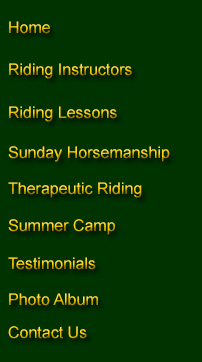 The staff is excellent, the riding lessons and trainers are friendly and professional. This farm has years of experience, i highly rocomend...take it from a kid, and a recent border." "You will never find a better farm. Awesome Instructors, beautiful and well tempered horses. I currently take lessons here and have never been happier with any other farm." "My daughter has been riding at Morning Star Farm for 4 years now and has recieved nothing but professional and caring instruction. From lead line to cross rails, the staff at Morning Star Farms has given my daughter the opportunites to advance at her own pace, and build her self confidence to where she can not only do what she sets her mind to, but excel at what she does." "I am currently the Advanced/Intermediate Instructor and what an incredible farm! Not only does everyone enjoy even riding by looking at the riders and horses, but the excitement builds the moment you turn in the farm. I have ridden numerous horses in my life and these horses and ponies are by far my favorite! You are in for a real treat when you lesson and/or board here! Our show season started off with a bang this year and we hope you will join in on the fun we have!!" "This awesome riding farm really is a dream come true! The horses and people are the nicest you'll ever meet! My have been riding here for 4 years and now board mine and my sisters horses here. They couldn't be treated better! The lessons and shows held here are great and there's always the opition nof away showing in Spring. The instuctor's all have star experience. It's a great place the meet new friends. : )"
"I am the Beginner Riding Instructor at Morning Star Farm. The kids and people are wonderful here and there is nothing more satisfying than seeing a child riding a horse with a smile on his/her face. We are blessed with beautiful horses and ponies and a program any child would love. As we always say its "An experience your child will remember for a life time." Proud to be a part of Morning Star Farm." "my family was referred to morning star farm by a family friend over three years ago when we moved from a large city to this tiny little hamlet. since then, both my daughter and son have learned to love and respect all the beautiful animals they have met at the farm. while the horsemanship and private lessons have taught my children to be exceptional riders, the instructors have taught them to be confident and strong. the assertiveness, gentleness and kindness they have learned has helped them excel as riders as well as young individuals. as a parent, i couldn't ask for more. i couldn't be happier!!!!!" "I have known Judy and Shelly for the past 9 years and trust them with my daughters safety. My oldest daughter is now working on the farm which is giving her great learning opportunities. My youngest daughter is enjoying every second of being there and learning something new every time she rides. Horses usually make me very nervous. Judy and Shelly have calmed my nerves and it has been a pleasure to watch my children learn how to handle, love and be safe around horses. Morning star farm will always have a special place in our hearts. We are looking forward to many more happy years at the farm." As a parent of an eleven year-old autistic boy, I have been sending my son for weekly riding lessons in the therapeutic riding program for ten months. Not only can I attest to the quality of the teaching, quality of horses, and constant safety protocol, but also praise the true sense of caring and commitment given to each and every student. My son has progressed so well that he just transitioned from a private half hour therapeutic lesson to a group hour long lesson. 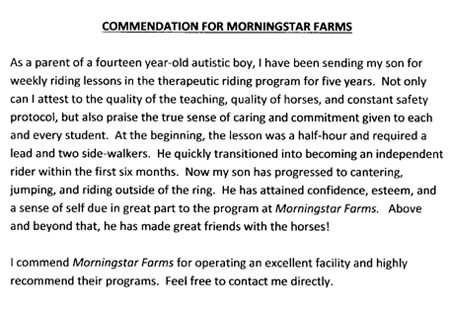 He has attained confidence, esteem, and a sense of self due in great part to the program at Morningstar Farms. Above and beyond that, he has made great friends with the horses! I commend Morningstar Farms for operating an excellent facility and highly recommend their programs. Feel free to contact me directly.